You know you've made a friend for life when your first meeting results in hair braiding. 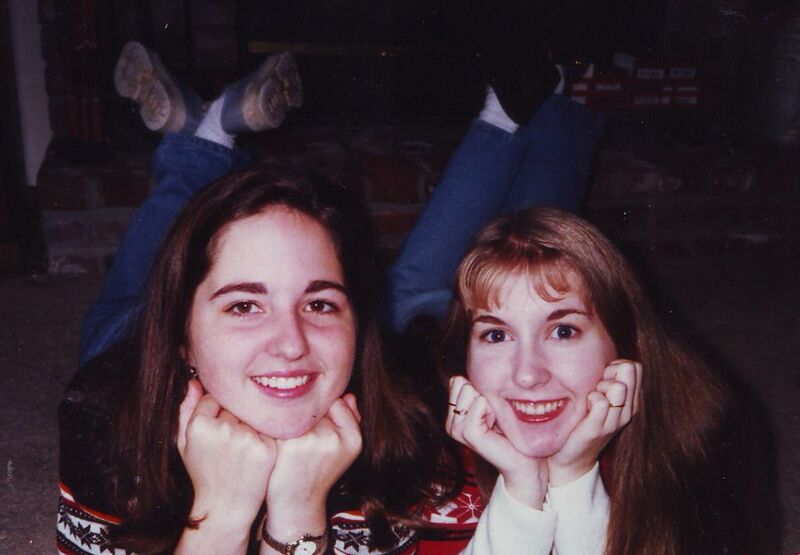 I met Joanna in junior high, at a mutual friend's birthday party. It was one of those "Where have you been all my life?" moments. 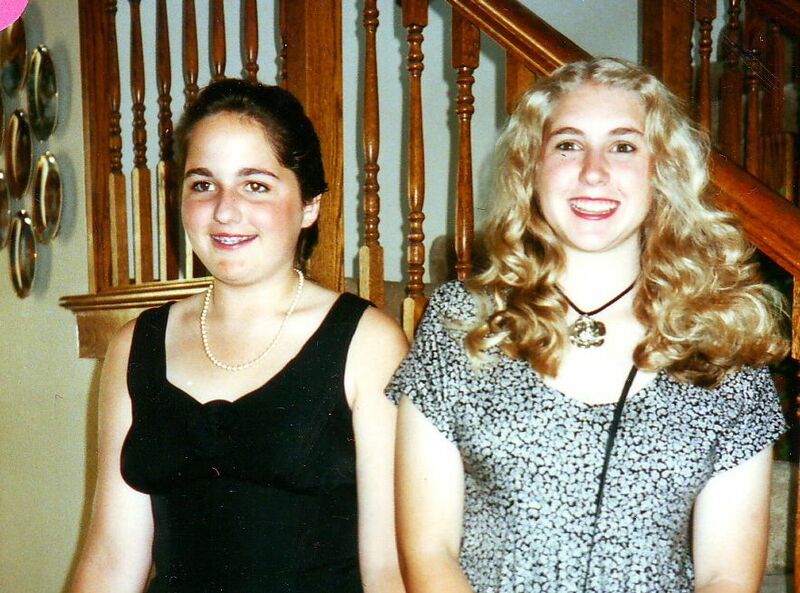 Ok - that may seem dramatic, but when you consider that my entire seventh grade year consisted of trying to fade into the background (braces, teal glasses, awkward early bloomer-ness and all), I think we can agree I was in desperate need of a real friend. 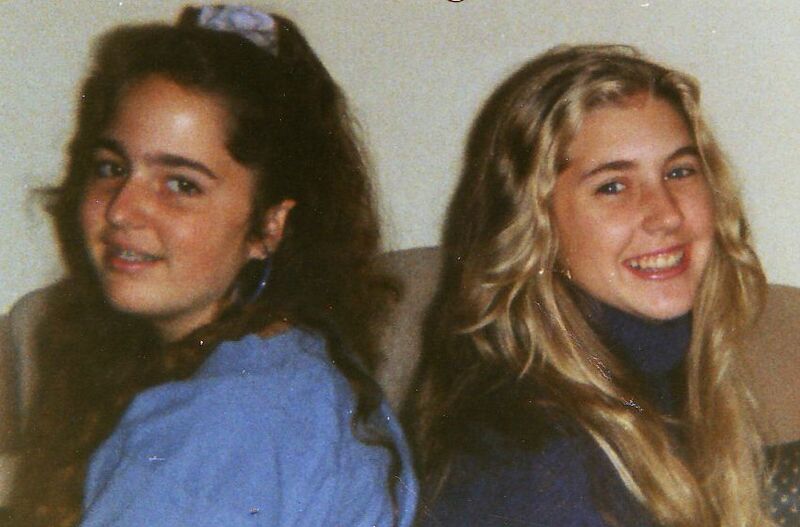 And here she was - giggling, confiding in me about her crush on the mysterious, brooding boy from our history class and letting me braid her hair. When my parents picked me up later that afternoon and asked how the party was, I replied matter of factly, "I met my best friend." 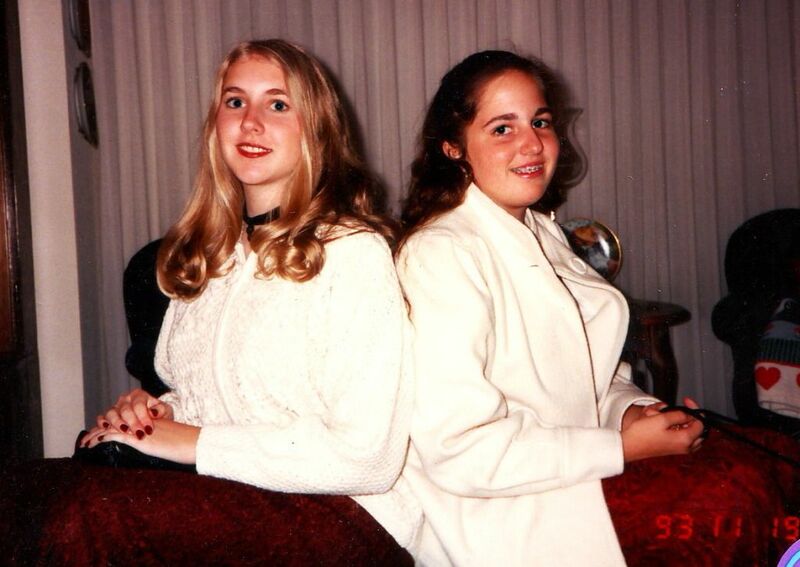 From that point on, I never had to worry about eating lunch alone, who to sit next to at the school assembly or who to carpool to the dance with. Joanna and I spent nearly every day together - passing old-school handwritten and intricately folded notes in class (I think I still have a boxful of these stashed somewhere at my Mom's house), tying up the phone line for hours dissecting the crush potential of every boy at school and otherwise navigating teenage life together. Joanna, or "Jo-Jo" as I called her, was my confidant, partner in crime and constant companion. 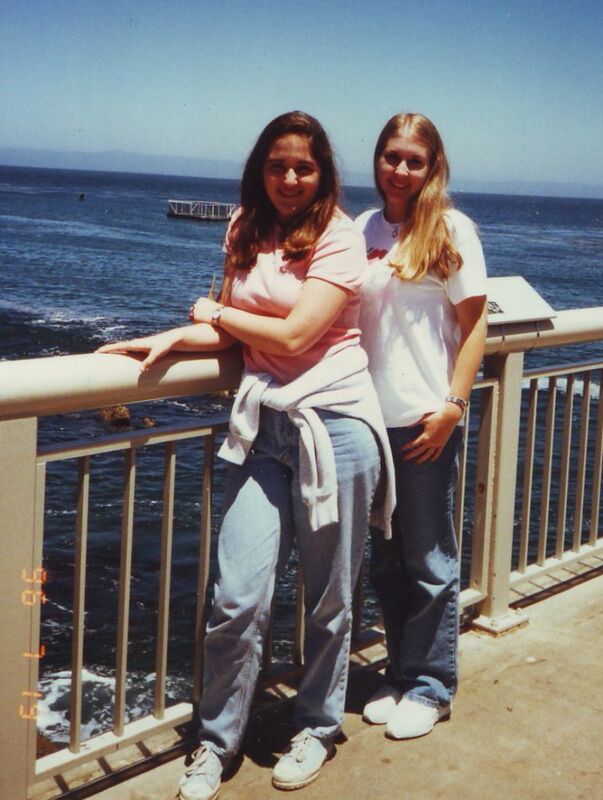 Joanna's family was warm and welcoming and happily took me in, setting a fifth seat at the dinner table several nights a week and even inviting me to tag along on Schrudder family vacations. It was with Joanna that I experienced my first tastes of freedom - after school attempts to be noticed by the who's who of eighth grade at Round Table, being dropped off for a couple of hours (sans chaperone) at the mall or movie theater, squeezing in the back of her older brother Greg's Geo Metro for a parent-free ride home from high school and exploring exotic, far off places like the Santa Cruz Beach Boardwalk and Disneyland. And it went both ways. 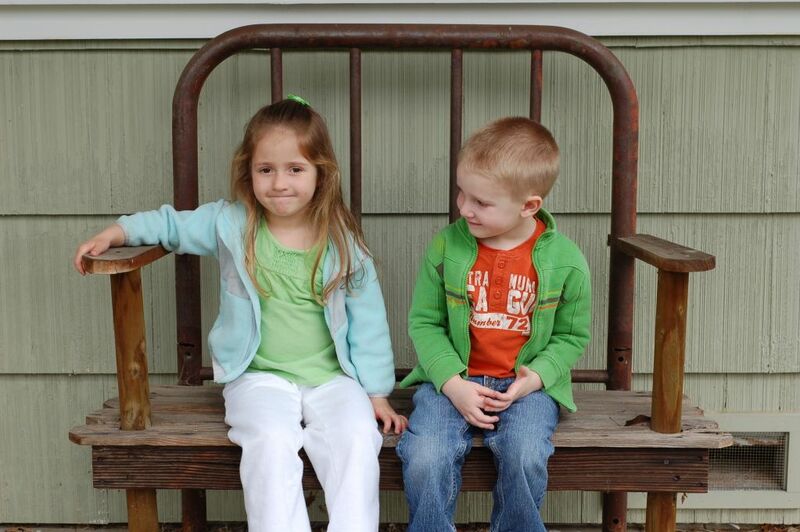 My family adored Joanna and eagerly fostered our friendship. She always had an open invitation to stay for dinner or spend the night. In fact, she spent so much time with my family that my dad routinely referred to Joanna as his "favorite daughter." 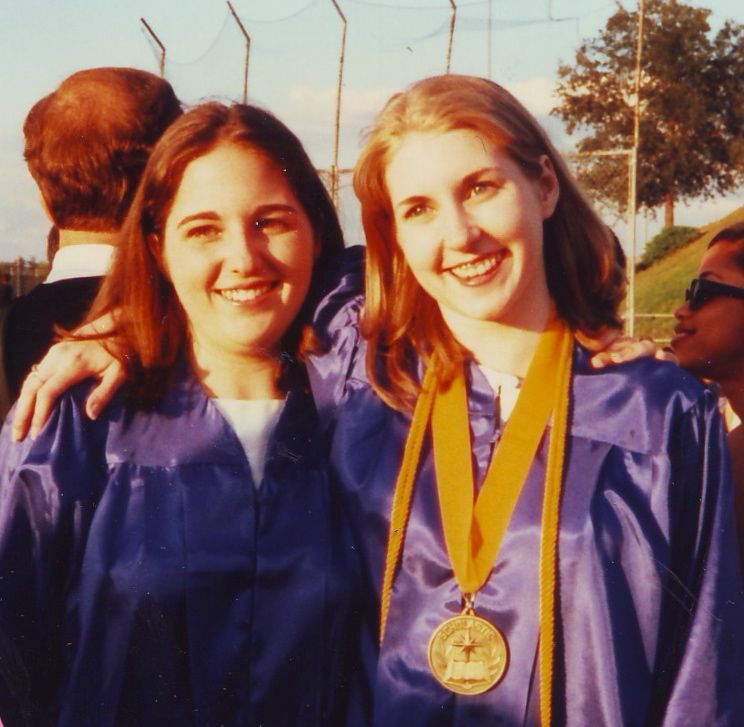 Then came high school graduation. While I was planning to attend UC Davis in the fall, Joanna would be moving into the dorms at Sonoma State, a couple of hours away. In the beginning, we talked constantly and even made weekend trips to visit one another in our new worlds. But things were changing. We were growing independently where we had planted ourselves, just as we were supposed to. 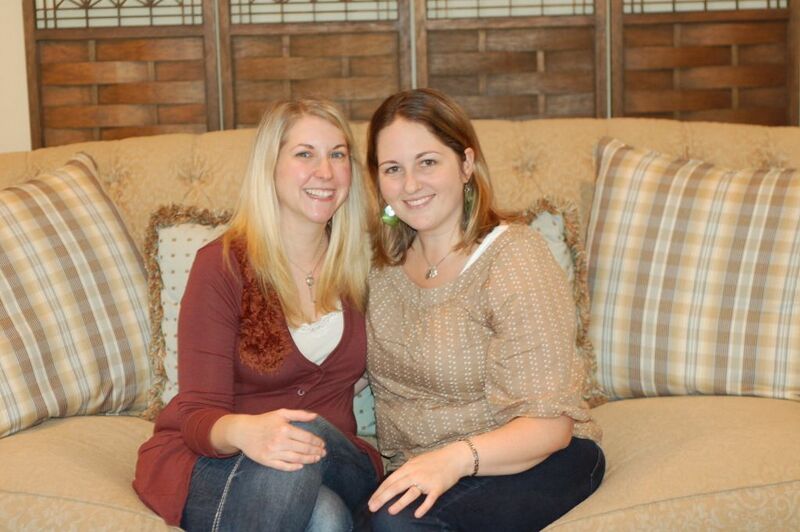 We made new friends, bonded with roommates and found our own niches in our new communities. Now, with twenty years of friendship behind us, a husband and two young children apiece and living half a state apart, I regret to say that our lives rarely intertwine outside of Facebook. 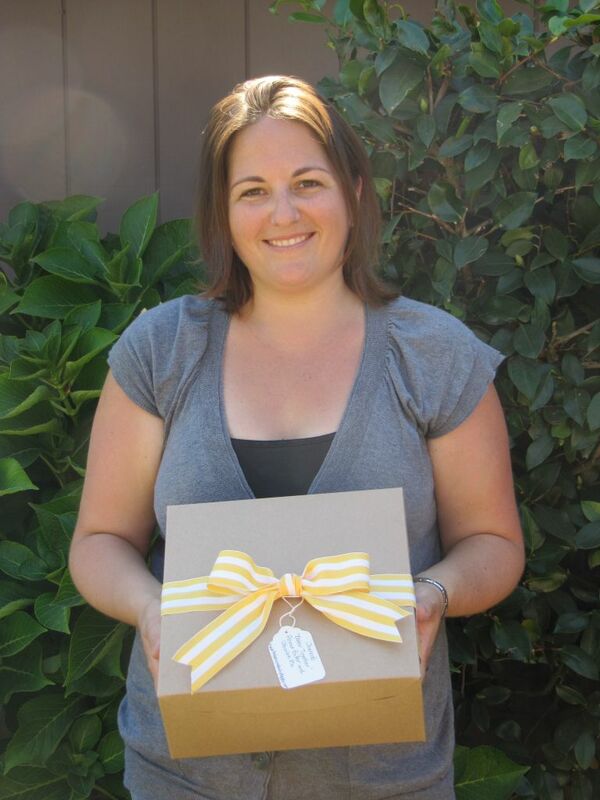 But when Joanna messaged last spring, saying she would be visiting family in Sacramento, I was so excited to catch up and meet the newest addition to her growing family. It was such a surreal experience to watch our children play together - meeting a new friend, not unlike we did on that fated day twenty years ago. It always just feels right in Joanna's company. Even when years pass between visits, I quickly fall right back into that comfortable rhythm that most friendships never quite discover. I guess it's true what they say - some things are just better together. Take peanut butter and chocolate. Sure, peanut butter on it's own is pretty tasty. I confess I have been known to sneak a spoonful here and there. And chocolate, well . . . is there really anything better than chocolate? Yes, I submit that there is - peanut butter and chocolate. It's one of those "the whole is greater than the sum of it's parts" kind of deals. I think Joanna and I are a bit like that - good on our own, but really spectacular together. 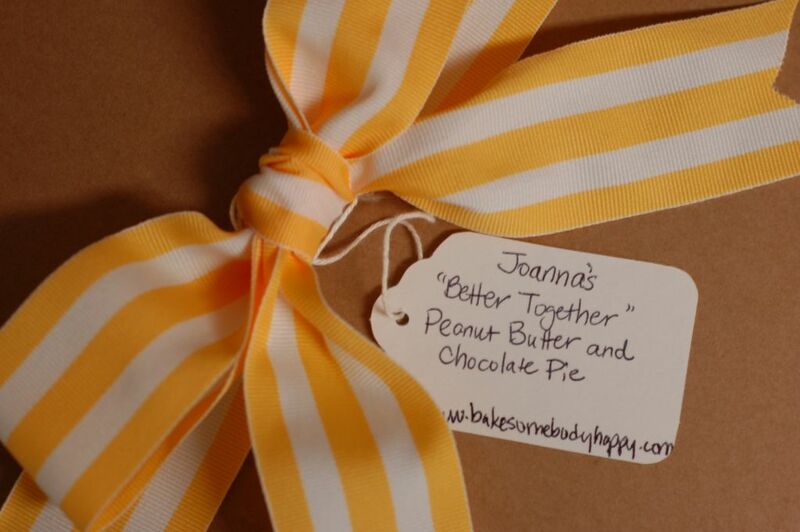 So, in honor of another welcomed play date and some much needed girlfriend time, I thought I would whip up a pie - Joanna's "Better Together" Peanut Butter and Chocolate Pie. Alright, I have a confession to make - I may have Pinterest stalked Joanna, just the teensiest bit. As luck would have it, much of her dessert pin board consisted of recipes chocolate in origin. And, as an added bonus, right smack dab in the middle of writing this post, Joanna pinned a recipe for peanut butter pie! How's that for kismet? I vacillated back and forth about what type of crust to pair with this pie. The options seemed endless - pretzel, graham cracker, Oreo cookie. 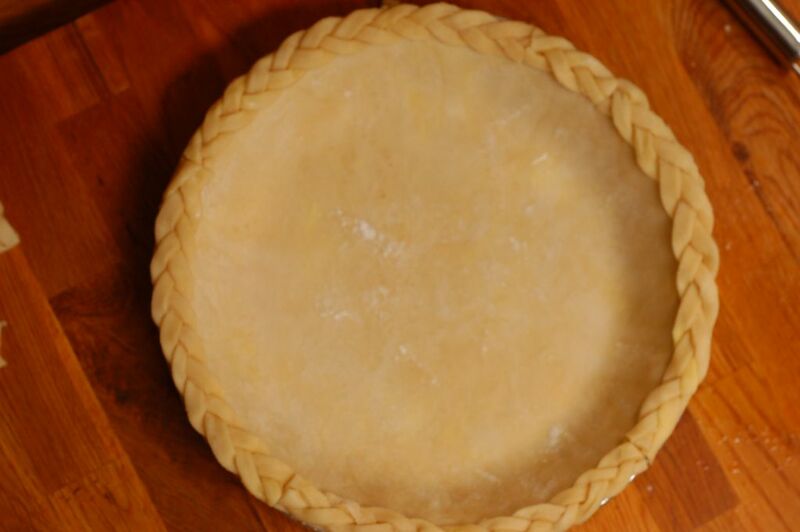 But in the end, I settled on my traditional combination of shortening and butter - largely because I was inspired to recreate a braided crust technique I had found online. The marriage of braids and pie just seemed too perfect an opportunity to let pass by. 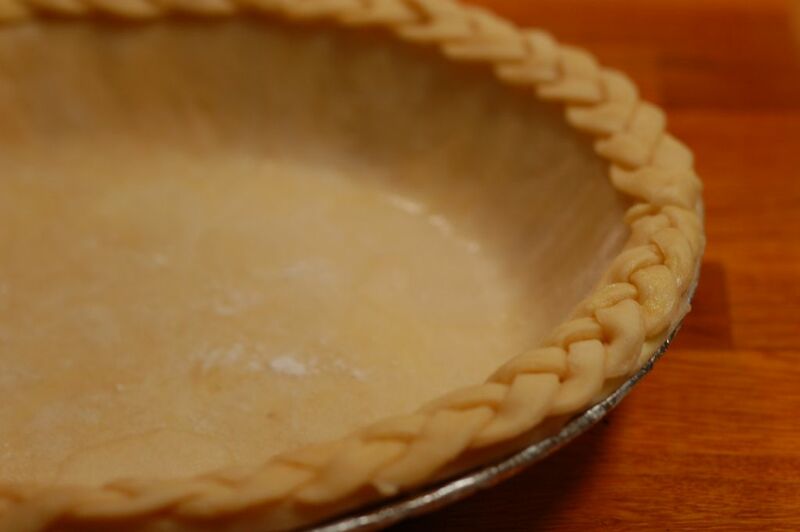 I have found that oftentimes the pastry techniques that appear to be the most difficult are actually the simplest - take, for example, lattice crust. But, be forewarned - this is not one of those techniques. 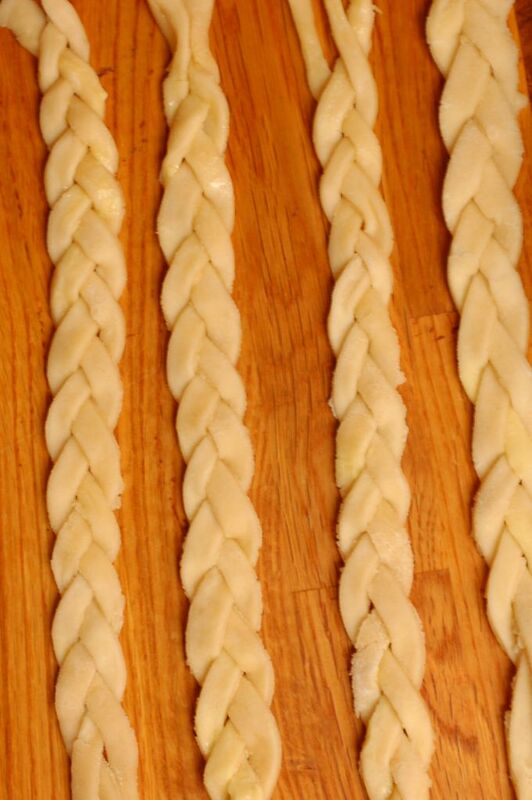 Braiding dough is quite possibly more difficult than it looks. 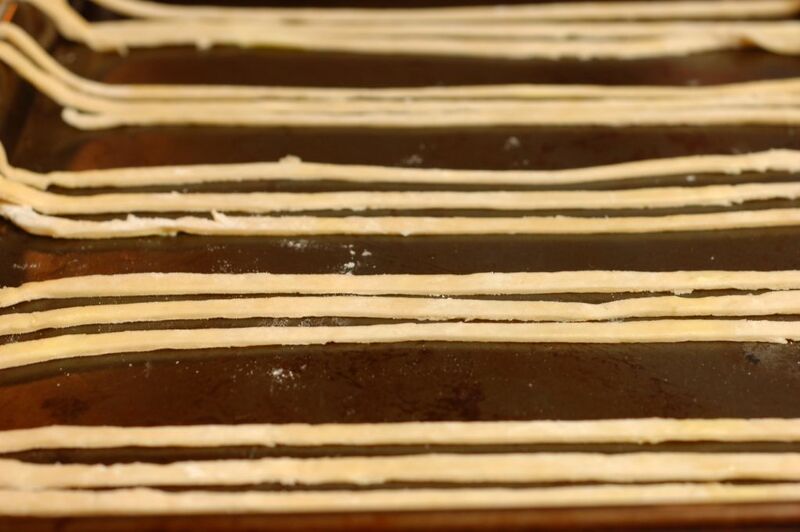 The necessary handling rapidly softens the butter, causing the lengths of dough to stretch just enough to make the whole braid misshapen. However, after several trips into the fridge to chill, I was rather pleased with this lovely edge. While the crust blind baked, I prepared the pie filling - a variation of the chocolate custard recipe used in my Thin Mint Pie. I brought egg yolks (the first straight from the coop! 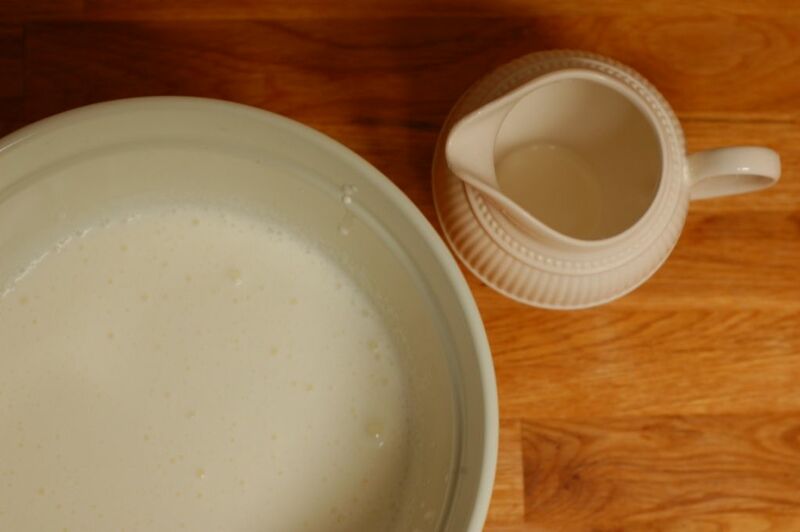 ), sugar, cornstarch, salt and whole milk to a boil, until it had thickened to a pudding-like consistency. 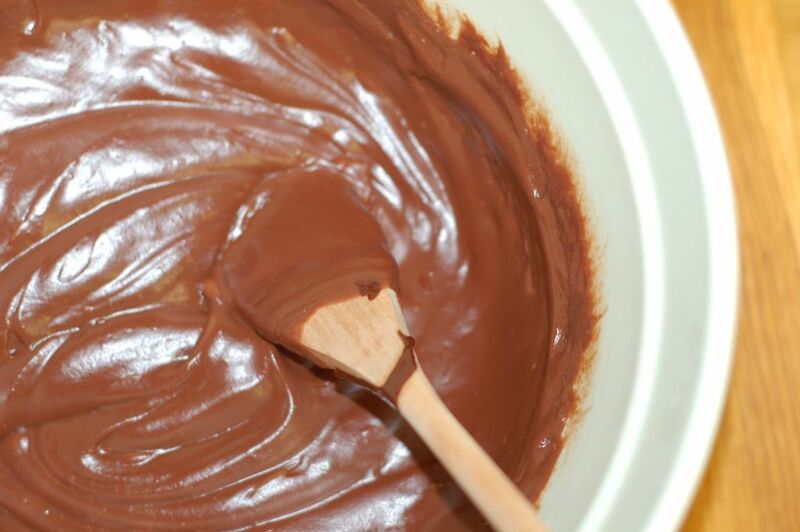 On a separate burner, I melted a combination of semisweet and bittersweet chocolate in a double boiler. Finally, I strained the custard before stirring in the melted chocolate, softened butter and vanilla extract. 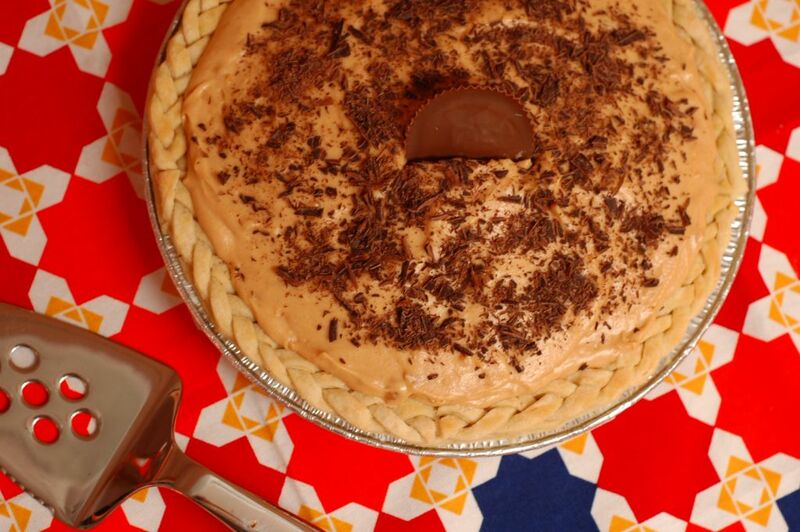 Once cooled to room temperature, I spooned the rich chocolate custard into the pie shell. 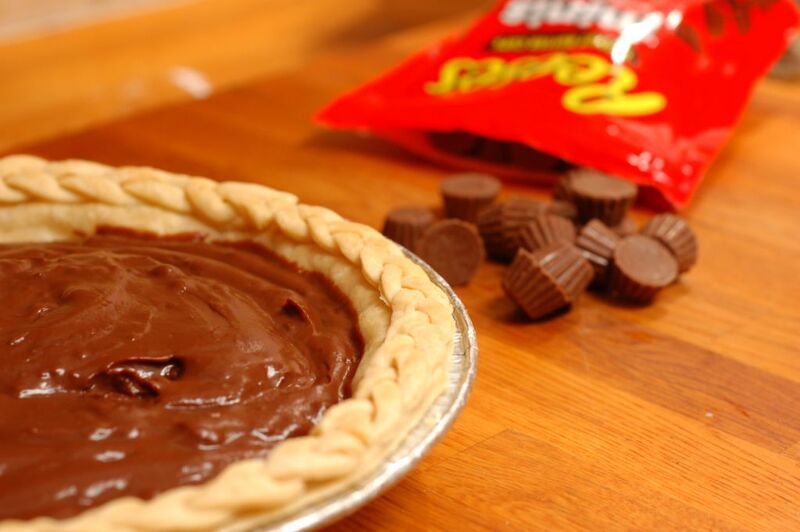 Then, I nestled miniature Reese's peanut butter cups into the filling, just to gild the lily. 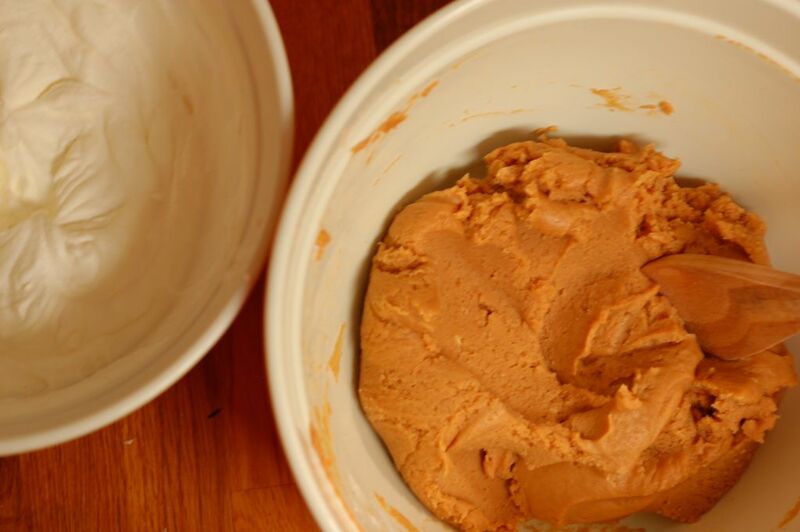 The final layer - a peanut butter mousse - began with homemade whipped cream. 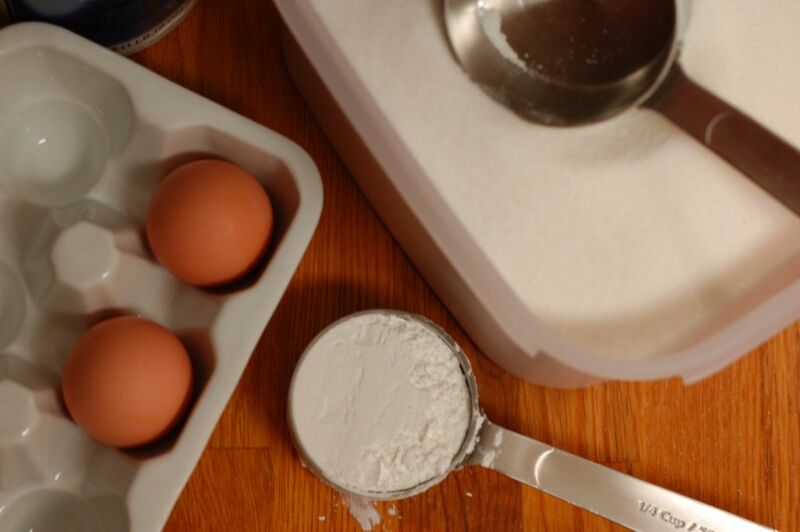 Having now whisked several batches by hand, I continue to ask myself why I don't yet own a KitchenAid mixer - or at the very least, a hand mixer - for tasks such as these. Alas, our small galley kitchen and limited counter space do not afford such luxuries. So once again, I whisked heavy whipping cream and powdered sugar, by hand, until stiff peaks formed (and my arm begged for mercy). 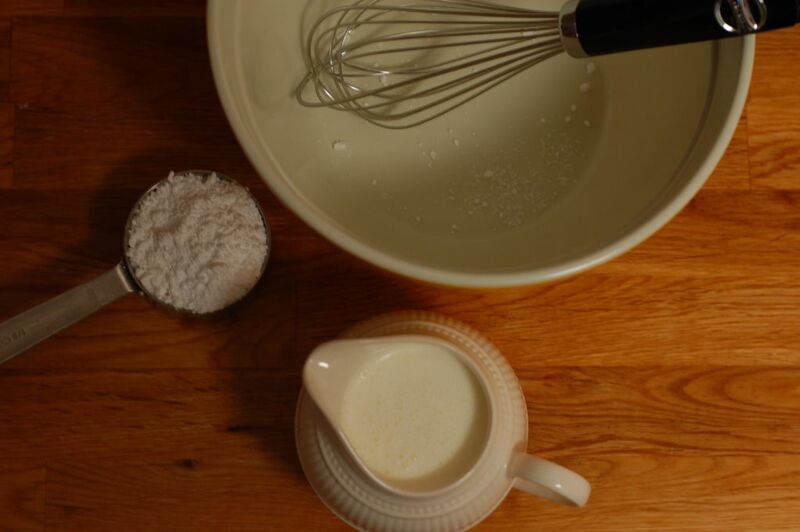 In a separate bowl, I blended cream cheese, peanut butter and a little more powdered sugar before gradually folding in the whipped cream, so as not to deflate all of my hard work. 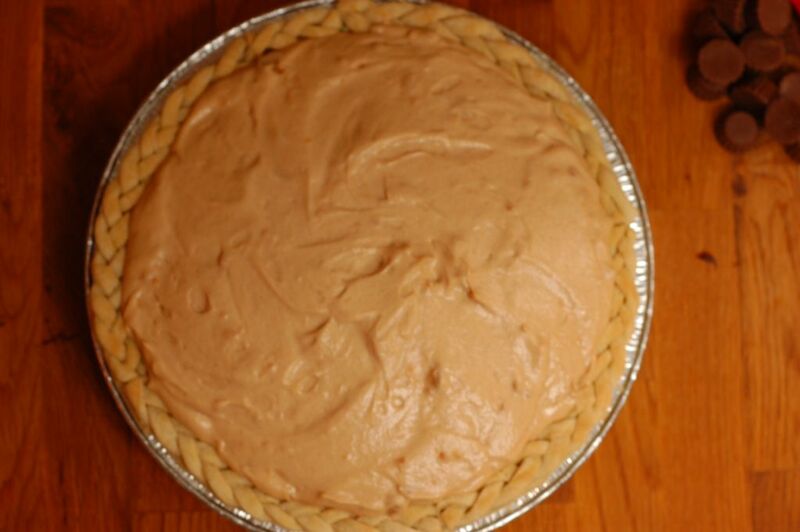 Then I spread a generous layer of the peanut butter mousse over top and placed the pie into the fridge to set. Although I was nearly certain of the flavor (having sampled here and there along the way), the overall beige appearance left something to be desired. 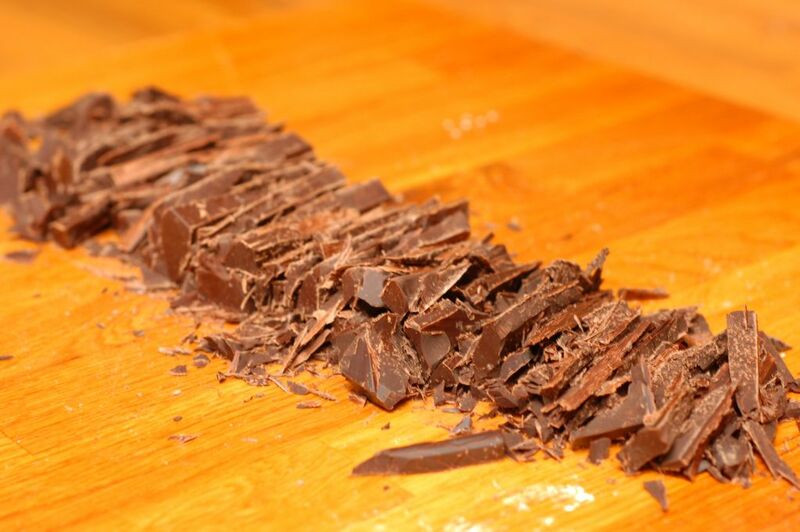 But a few minutes later, covered in dark chocolate shavings and topped with a single inspiration candy, I breathed a sigh of relief. It was ready for delivery. Even now, when I am with Joanna, I revert to that familiar place of safety and love that only the oldest and dearest of friends can offer. As we sat and discussed such grown-up topics as work, marriage and parenthood and watched our little ones chase each other around her parents' yard, I was struck that I just honestly never pictured us being this old. I think Joanna will perpetually be fourteen in my eyes - in the best of ways - just as I feel every time I am with her. Forever young. Although I miss our day to day friendship terribly, I am continually grateful for these visits - however few and far between. As Joanna wrote in the pages of my senior yearbook, "No matter how far apart we may be in the future, I know that our hearts will always be together." Wise beyond her years, that one.